Bauman born in Warsaw, Poland, now living and working in Britain. As a landscape painter,whose interest lies not in narrative, but in form defined by light, she has been looking for motifs as contrasting as the cultivated landscapes of the Mediterraenean and the deserts of north Africa and Australia. Although de-populated, they are marked by a structure imposed by the human hand ( geometry of fields, repetition of trees and other natural elements) or by my own formal order of compositional elements , resolved usually within the square format. The images, work both on a figurative and abstract level, the surface of the panels characterised by varied marks and textures achieved by a complex mixed media technique combining plaster, resin, wax, sand, acrylic texture gels and pigments. She developed the technique in my search for visual equivalents of the particular character od each landscape – the subtleties of the various media combine to evoke the genius loci of each place. Her works are part of collections such as Saatchi and Saatchi, Gordon Ramsey, United Airlines, Warner Bros, Trevor Nunn, Penelope Wilton, State Street Bank, Amec International, Linklaters and Alliance, Theodore Goddard, Deutsche Bank, Burlington Resources, Freshfields, Apax International, Dorchester Hotel. 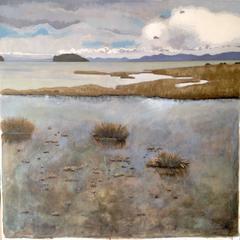 Wellington Bay, New Zealand is an Original, Oil on Canvas. Exquisite use of colour, from the beige cream sands to the pastel soft blues, sea and skyline. The eye is drawn in several places from the shape of the tide to the fore of green shrubbery. Clever use of brushstroke allows you to feel the texture of the plants. Bauman is a BBC reviewer. Exemplary Art Reviews. Original, Oil on Canvas. Personally Signed. Stunning etching done by Fred Graf, titled "Rocks at Sea" circa 1940.